You can use 3D Grips to edit features on your models, but how does this affect existing constraints on your sketches? 3D Grips can move a sketch profile away from the origin of the sketch if it is not constrained. In this short exercise you’ll see how constraining a node on the profile to the origin of the sketch prevents the profile from moving relative to the sketch origin. 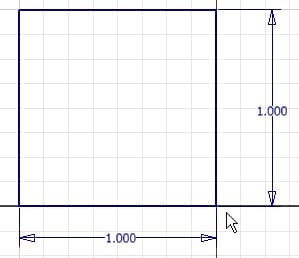 First use the Standard Part template to create a 1-inch cube. Draw a square on the origin of the sketch plane, and constrain the node on the origin with a Fixed constraint or use the green snap dot to constrain the node. Add 1-inch dimensions for the height and width, and then extrude the square 1-inch. The next step is to use 3D Grips to edit the cube. Before you get started, make the sketch visible so that you can see which corner of the sketch is constrained to the origin.